Have you ever visited a tree farm before? Had the chance to see where Christmas trees are grown? When I think of what it would be like to visit a Christmas tree farm in the winter, I seem to instantly get warm flurries in my head about how magical and inviting it must be. Why not harness that magical feeling to create a rustic Christmas wedding on a fir tree farm? With its natural rustic winter ambiance, you’re already half way there to creating a memorable wedding that no ballroom can compete with. It takes just a few more elements to complete this design and turn it into a cohesive wedding theme. For this concept, lots of natural greens with burlap accents is key. Simplicity rules in this design, with no fuss, and a focus on the natural beauty that the growing fir trees have to offer. If the couple (or planners – this would be an unexpected but fantastic corporate themed holiday party too) felt so inclined to be more environmentally friendly, there are a number of options available. Having the paper elements printed on recycled paper, gifting guests seedlings to take and plant somewhere, even offering to have guests give donations to the tree farm instead of gifts, the list can go on. What is a clever way to be more environmentally friendly at parties and weddings? Do you find yourself getting all warm and fuzzy on the inside when you think of the coldest days of winter? Are you at your happiest spot on the icy, cold days when there is barely any sun to note? Or maybe you are just a fan of Frozen, and have your heart set on an icy, winter themed wedding. If any of those ring true to you, or even if you are a bespoke bride who loves pushing the boundaries, you are going to love this week’s wedding idea board. Channeling my inner Ice Queen love, I scoured the internet for some of the top ideas for an icy winter wedding. This wasn’t just any celebration, oh no. I’ve shared my take on a frozen icicle holiday party before. This wedding inspiration board had to be fit for the ice queen herself. A complete vision of venue, ice sculptures, frosted icicle accents, and of course: a massive ice bar. Are you cool enough to handle an icy wedding like this? Or do you find yourself longing for a spring wedding on the countryside? There was a time I was fearful that I had run out of things to see and discover on Pinterest, but oh how wrong I was! I have found several, absolutely one of a kind images the last few days, and have had an overwhelming sense of inspiration and ideas come to mind after discovering them. The first piece of beauty I found was a regal looking altar, draped in a dark green velvet, adorned with crisp white orchid flowers along the top. To heighten the look even further, there are gold, regal tassels and fringe accenting the drapery, creating a simple but stunning design. There was no turning back once I started down the path of devising the perfect combination of elegance and class that this wedding inspiration board demanded. I am over the moon with the elements I’ve included in this week’s wedding post. 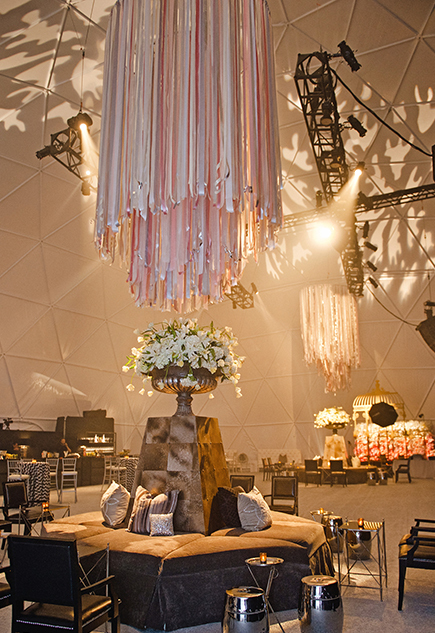 Lots of gold accents, plenty of green velvet, and of course more bright white orchids. Together, they create an almost enchanting, storybook-esque winter wedding. While I think this would be a beautiful Christmas wedding in general, I would particularly love to see this wedding done on a day like New Year’s, or perhaps even Valentine’s Day. There is something so romantic about the textures and bold use of this luxurious dark green velvet that could really play to those holidays. What are your thoughts on this sophisticated winter wedding that mixes green velvet and crisp white orchids?